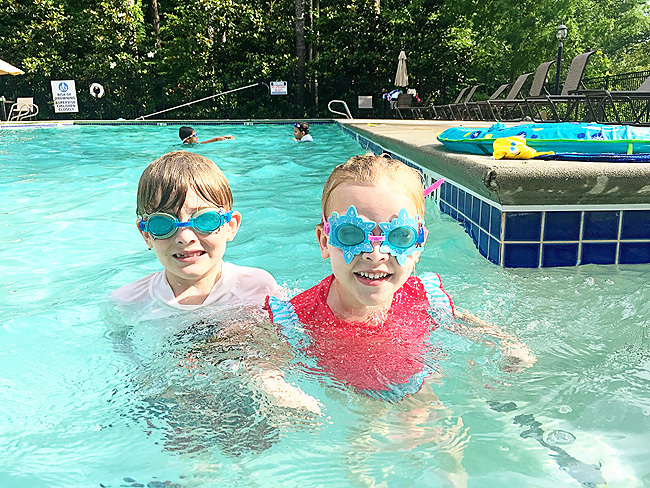 This post was sponsored by SwimWays as part of an Amabssador Program for Influence Central and all opinions expressed in my post are my own. Summer time is here and we have parked ourselves at our home for the next three months - the pool! Sure we might take occasional breaks to do things like eat, go to the bathroom, or head to the beach. But otherwise, if you need us you can find us at the pool. Every time we go to the pool I am outnumbered. Three kids, one mom. It seems like an overwhelming task - especially with younger kids. 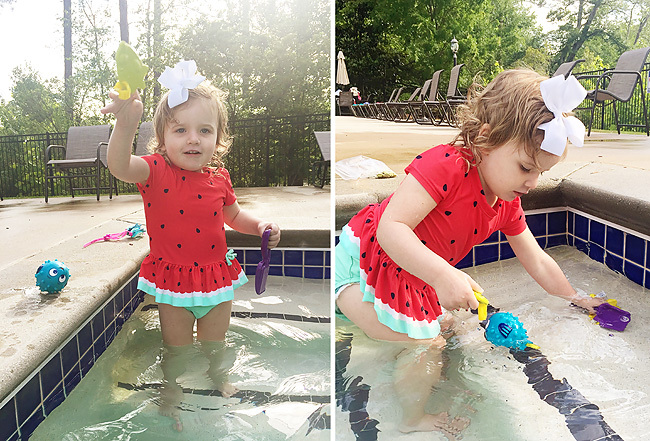 But for our sanity and the cleanliness of my home, I make sure we burn all of that kid energy off poolside. Plus during the heart of summer it's the best activity we can do to beat all that heat and humidity while still exercising and having fun. And I do mean FUN! Yes, it takes a lot of work to get everyone to the pool, and it can be a nerve wracking experience to keep everyone alive, but I have just as much fun as the kids. Maybe even more so because they aren't quite big enough to dunk me yet, and I have years of experience on them when it comes to the "Who can make the biggest splash?" contest. Luckily, I have some serious water babies, and going to the pool everyday is an activity that more than satisfies them. We've been making our trek to the neighborhood pool since they were all infants and not once at the pool have I ever heard the words "I'm bored." uttered. Once my children started multiplying it became a great way to entertain the older ones while I was keeping up with the babies needs. The moment those tiny tots were able to sit in their little SwimWays Baby Spring Float meant that we were all able to join in the fun. Then the day those tiny little ones started to swim on their own opened up a whole new world of pool time fun. 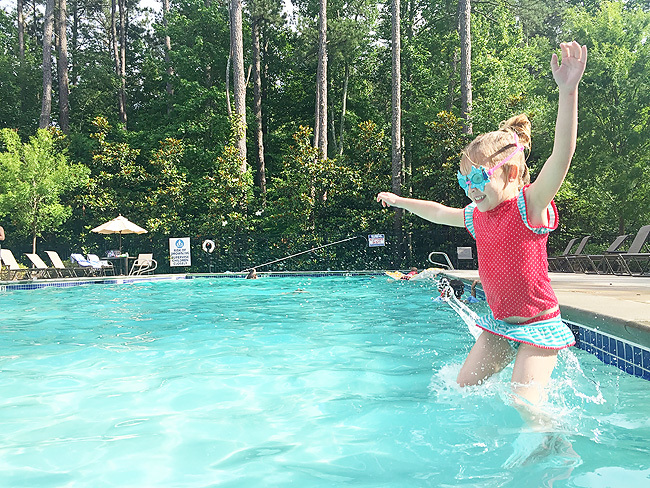 The endless amounts of games to play, friends to swim with, and memories being made all makes up for the overwhelmingness of being one person trying to keep three tiny humans safe and happy at the pool. 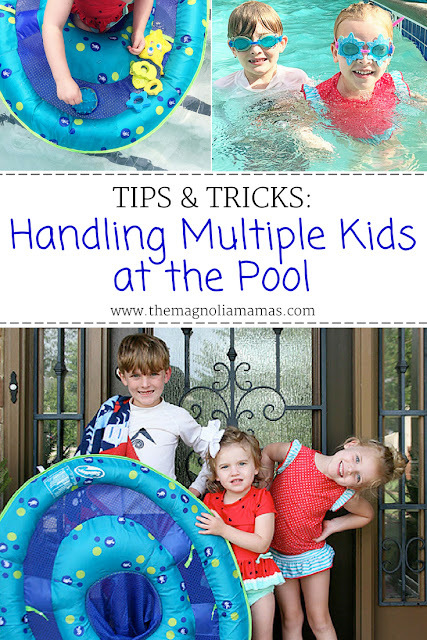 With tons of advice from fellow moms, and a few years of experience under my belt here are my tips and tricks for easily handling multiple kids at the pool (while still having fun yourself!). Get Pre-Screened - Make sure you put your sunscreen on BEFORE you get to the pool. This tip is huge. Nothing is worse than trying to wrestle sunscreen on kids when they see the pool and their friends only two feet away. I don't care how fast you are with a spray can of SPF. The second those kids see that crystal blue water they are gone. 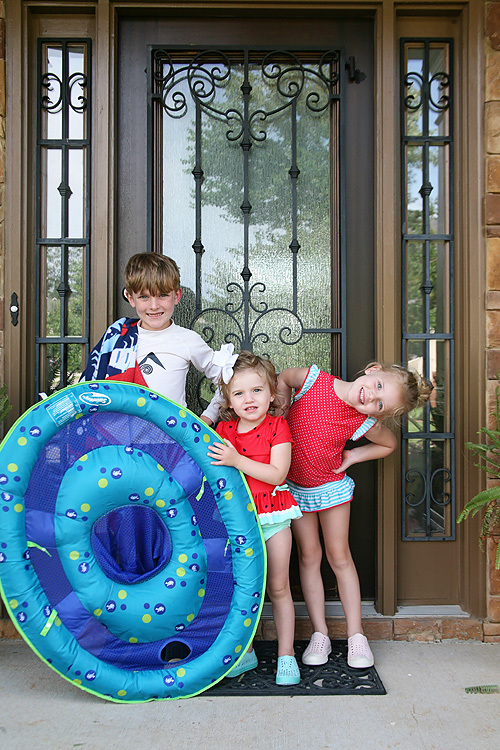 Safety First - As mentioned, one of the biggest stresses about taking kids to the pool is water safety. Multiply that by two or three (or more!) and that stress amplifies. Your arms are full, and often don't have enough hands to keep everyone afloat at the same time. But the stress can be minimized by having great water safety devices, and well established boundaries all ready to go before you get there. 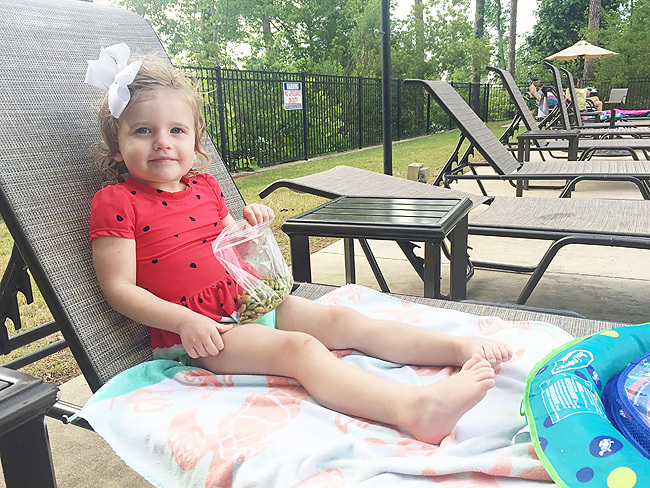 We know the importance of teaching kids to swim, but in that stage before they learn to independently swim I like to bring good safe back-up with me to the pool. 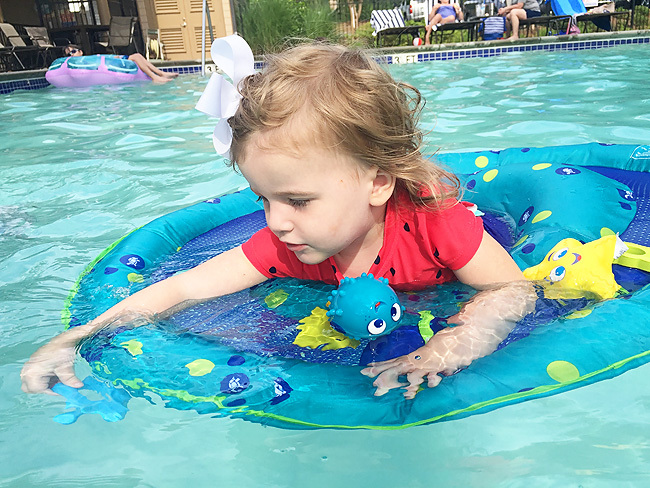 My favorite piece of pool equipment of all time for babies and young toddlers is the SwimWays Baby Spring Float Activity Center. It's built for little ones aged 9 months to 24 months, and is the #1 selling baby float in the U.S. The moment I grabbed one myself all those years ago on a Target run at the suggestion of a friend, I could see why. L.C. is my third child to use a SwimWays Baby Spring Float, and I will be so sad when she outgrows it. It has been a huge helper to allow babies to float and enjoy feeling as if they are swimming independently, but keeping them safe. I've been able to have an arm free to help the others work on their backstroke, catch a ball or be involved in one of those games of Marco Polo. 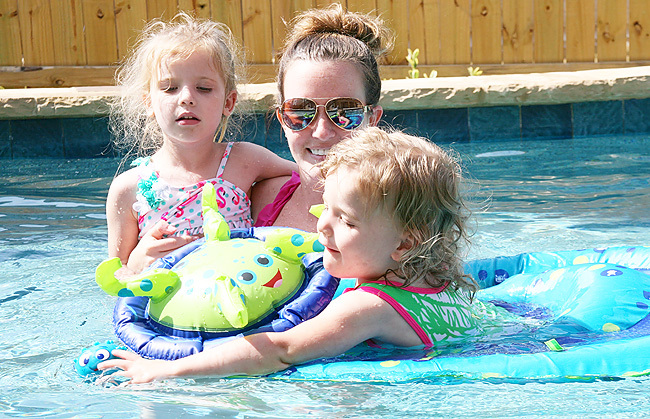 Don't Forget the Toys - No matter how you go about it, pool toys are just a must when it comes to kids and the pool. Every kid wants them, and every parent has a pool bag full of them. We are all in this together! 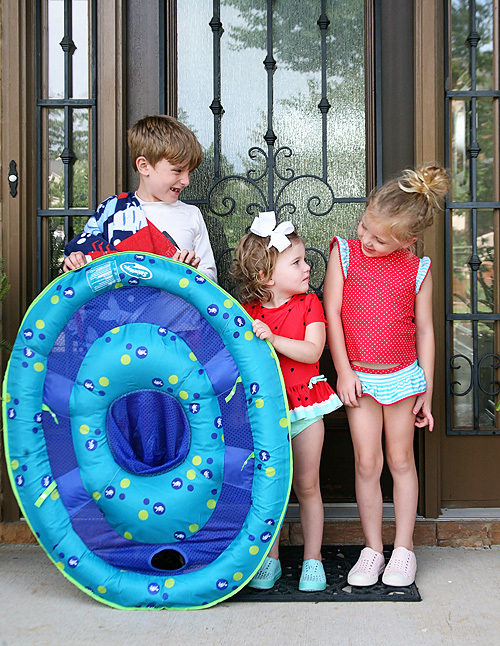 After years of experience, and finally crafting how to get three kids and all of our pool stuff from my car to the pool in only one trip (trust me, that was the best day ever! ), I've realized what pool toys are most popular. Never underestimate the power of a good old fashioned football and dollar store water guns. Diving rings will forever reign strong. Simple plastic cups are gold. Anything with a net is a winner. And sharks - sharks toys are beloved by any and every child. Anything that floats, squirts, or can be chewed will always win baby's heart. Toys that serve dual purpose win mom's heart. Remember that whole one trip from the car I was excited about? Less is more. 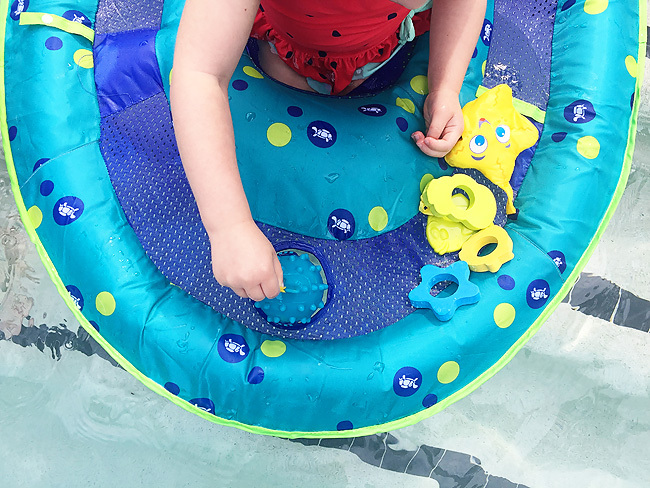 The SwimWays Baby Spring Float Activity Center comes with several detachable toys (a squeaker, stacking rings, a rattle and a soft touch star). The younger crew loves playing with these both on and off the float, so no need to bring extra toys! Get in the Water - Lounging leisurely on the side of the pool just won't happen. Go ahead, make the first cannon ball and get it all over with. You'll be in the water already in case anything happens, and to be honest it's just plain fun. So be the fun mom, get your hair wet, and enjoy these moments. Because before you know it they won't want to have you catch them off the side of the pool, play Categories with them or show you how they learned to float. Somewhere in the grand scheme of life we will all transition over into that embarrassing human being at the pool who is trying to place anything above SPF 5 on their skin, and OMG wearing that bathing suit out in public. Embrace it and enjoy it. 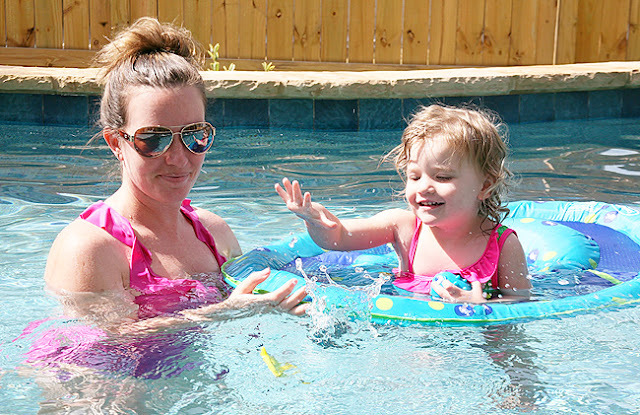 Your kids will love remembering you splashing and playing right along with them. The memory of that holds a lot of weight - for both of you. 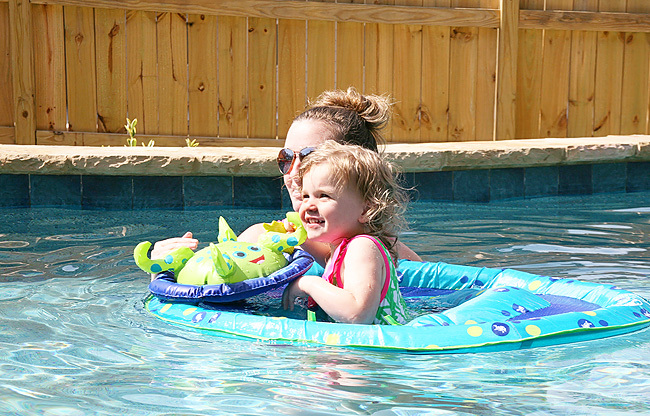 What are some of your favorite tips and tricks for bringing multiple kids to the pool?